These keto paleo biscuits are light and fluffy with soft undertones of butter and subtle hints of coconut. Better yet, they are low carb and gluten free without skimping on flavor or texture! Preheat oven to 400 degrees F and line a baking sheet with parchment paper. Optionally, you can sift the almond and coconut flour for an even lighter texture. In a medium-sized bowl, mix together almond flour, coconut flour, baking powder, salt, almond milk, and 2 tablespoons butter. Mixture should be coarse and crumbly. In a separate bowl, using an electric mixer, beat egg whites on high speed until soft peaks form-- around 3 minutes. Add the egg whites to the flour mixture and stir until completely combined. When combining the egg whites, don’t use a food processor or hand blender to mix as it may affect the biscuit texture. Use an electric beater on the lowest setting just for a few seconds if you need to get lumps out. Your egg whites will fall completely -- this is expected. Allow dough to sit for five minutes as the coconut flour will absorb liquid. You want your finished dough to be the consistency of good oatmeal -- not too thin and not gluey. If too thin, add coconut flour 1 tablespoon at a time and give it a few minutes to thicken appropriately before adding any more. 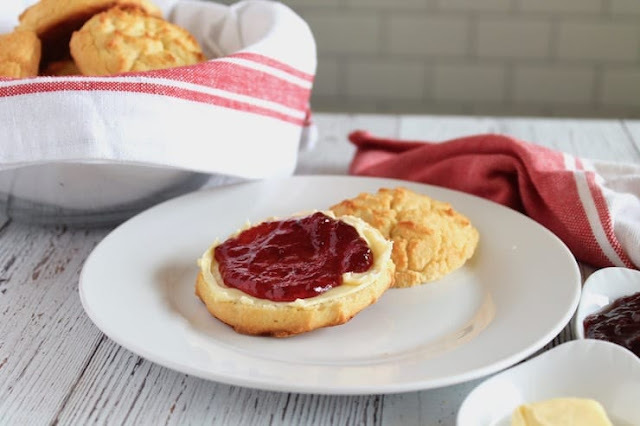 Using a muffin scoop or spoon, drop biscuits onto parchment paper at least one inch apart. Put in the oven and bake. After about 10 minutes, brush the tops of the paleo biscuits with melted butter if desired. Bake another 5-10 minutes or until the tops are golden brown and a toothpick comes out clean. 0 Response to "Southern Style Fluffy Paleo Biscuits (Keto & Low Carb)"